Few rooms in a home garner as much attention as the master bathroom. Second only to the kitchen, a beautiful master bathroom is near the top of almost every homebuyer’s wish list. But, if you find yourself stuck with a less than stellar master bathroom, a renovation can give you all the features you’re looking for. 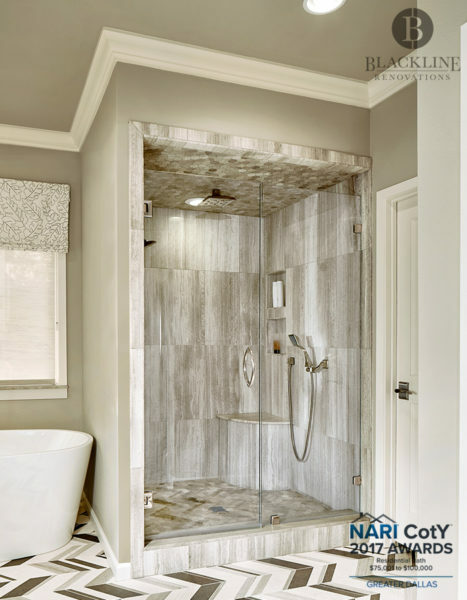 In fact, the master bathroom is a place that many homeowners can splurge- from claw foot soaker tubs to steam showers and heated floors. The options are truly endless. 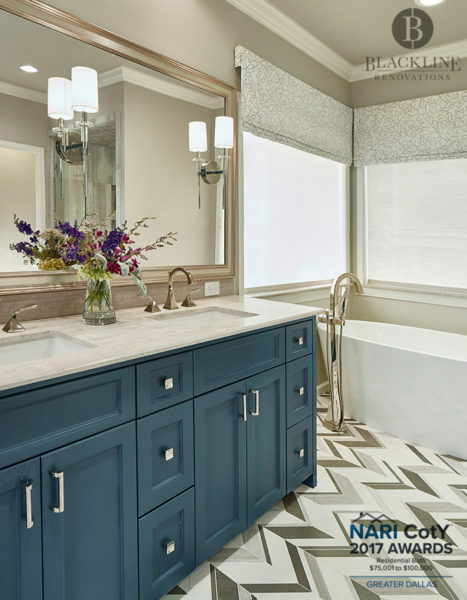 One of our most recent projects was a master bathroom renovation in North Dallas. “I found Blackline Renovations through a Google search while I was searching for Dallas design build renovation firms. Other firms I talked to were not taking smaller projects, but when I talked to Chris Black, he was really professional and I just liked him right away,” said Courtney Stovall. Like all of our projects, we started the Stovall’s renovation with an in-depth conversation to find out what they wanted in their final design, and also to walk them through the process of the renovation. “When we started, Chris came out and looked at the bathrooms. We shared our wish list and he had his architect draw up two different plans for the master bathroom and we chose one. From there, I worked with Jennifer to choose materials and colors. She was such a huge help- I really couldn’t have done it without her. She helped me pull the pieces and colors of tiles and countertops together and see the big picture,” said Stovall. Stovall wanted a contemporary style master bathroom. She chose a light countertop and neutral navy cabinets, while the herringbone floor remained the star. As part of the reconfiguration of the bathroom, Stovall gained more master bedroom closet space. Even though sharing a bathroom with her daughter during the renovation was not particularly fun- “everything was miniature in there!”- the end result was truly worth the effort and sacrifice. Home renovation is an extremely personal process. From concept to construction, your designer and contractor learn intimate details about your finances, your lifestyle, and your personal taste. Finding someone that you can trust and get along with is key to any successful renovation. We’re so glad that the Stovalls found that with us. Blackline Renovations was honored by NARI for this renovation.